The historical mask that provided the inspiration for my interpretation is shown above. Origin: Africa. This mask was originally a small brass mask in the lost-wax casting tradition. Size 11x17 on 8x8 Plexiglas stand. 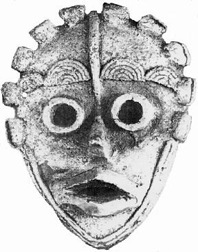 The Kra mask was thought to bring good fortune to the owner. Who wouldn't want this one! Can be done in a vast combination of colors.